A new Web tutorial offered by the Federal Highway Administration's (FHWA) National Highway Institute (NHI) introduces Federal, State, and local highway agency employees and consultant personnel to the fundamental concepts needed to inspect drilled shaft construction. The 4-hour training, Drilled Shaft Inspector Tutorial (Course No. FHWA-NHI-132070B), covers the inspector's work prior, during, and after completion of the drilled shaft construction process, including documents and tools required for inspection and equipment and site checks. Focus areas include the inspector's roles, functions, and responsibilities at different phases of construction. Also addressed are theoretical and actual calculation of drilled shaft concrete volumes and post-installation, load, and integrity tests. NHI recommends completing the tutorial before attending the instructor-led course, Drilled Shaft Foundation Inspection (Course No. FHWA-NHI-132070). This 2.5-day course provides a basis for local, regional, or national qualification of drilled shaft inspectors. The goal of the course is to provide inspectors with practical knowledge and standard industry practices for the inspection of drilled shaft foundation construction. The training follows recommended FHWA specifications and practices for drilled shaft foundation construction, but may be modified to follow local agency specifications and practices. The course fee is $680 per person. For more information on taking the tutorial or scheduling the instructor-led course, visit www.nhi.fhwa.dot.gov and select "Search for a Course." For questions on the tutorial content, contact Justice Maswoswe at the FHWA Resource Center, 410-962-2460 (email: justice.maswoswe@dot.gov). To learn more about FHWA's Geotechnical Engineering resources, visit www.fhwa.dot.gov/engineering/geotech. Topic areas include earth and rock works, earth retaining structures, geotechnical hazards, ground improvement, structural foundations, and subsurface investigation. Featured resources range from details on conferences, Webinars, and training opportunities to copies of FHWA publications and guidance memos. 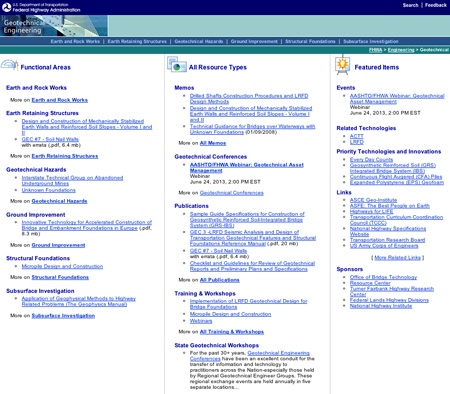 Also included are links to other useful geotechnical resources. Learn more about FHWA's Geotechnical Engineering resources by visiting www.fhwa.dot.gov/engineering/geotech.